Blue/Green Permit Enforcement Begins January 12, 2015. Here is your quick reference on the parking rules. 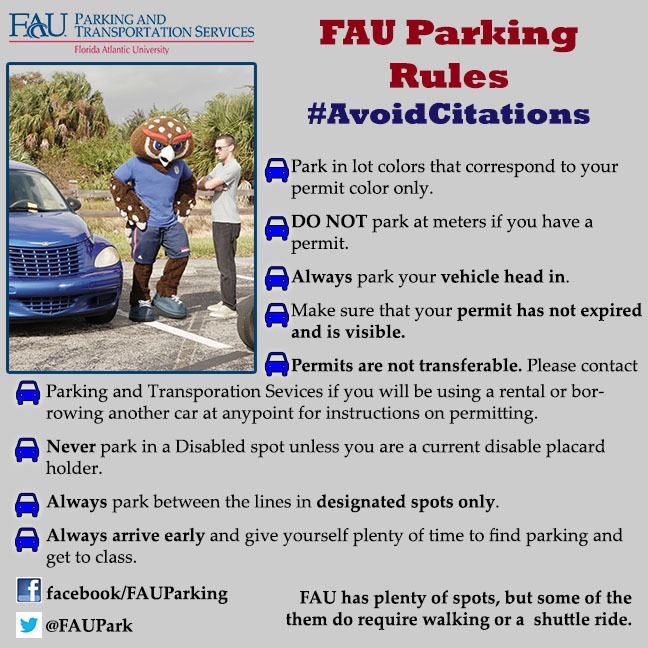 Take a moment to read them and #AvoidCitations. Remember: We have lifted the permit requirements in GREEN and BLUE lots for the first week of the semester. Students may park in any GREEN or BLUE lot without a permit displayed until January 12, 2015. New Permits can be purchased online using your MyFAU account. If you are replacing a permit, bring in the old to the Parking window in the Student Support Bldg. for a free replacement. (If you don’t have the old one the fee is $15).